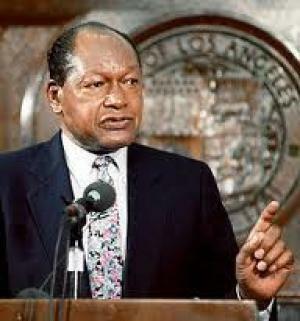 December 29, 1917 Thomas J. Bradley, the first African American Mayor of Los Angeles, California, was born in Calvert, Texas but raised in Los Angeles. In 1940, Bradley became a member of the Los Angeles Police Department and rose to the rank of lieutenant, the highest ranking African American at that time. In 1956, he earned his Bachelor of Law degree from Southwestern University School of Law. 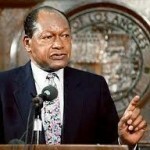 Bradley was elected to the Los Angeles City Council in 1963 and served until 1972 before being elected mayor in 1973. He served five terms as mayor, making his the longest tenure of any mayor in the city’s history. In 1982, Bradley ran for Governor of California and all the polls had him ahead but he narrowly lost the election. This gave rise to the term “the Bradley effect,” which refers to the tendency of voters to tell pollsters that they are undecided or likely to vote for a Black candidate but then actually voting for the white candidate. After the election, Bradley practiced law with a focus on international trade issues. Bradley was the 1985 recipient of the NAACP Spingarn Medal and he died September 29, 1998.